Test kits are available for performance verification of UV-Visible Spectrometers; a certified UV-Visible Reference Kit and a Neutral Density Filter Kit. The UV-Visible Reference Kit is traceable to standards certified by NIST (National Institute of Standards and Technology). For quality assurance and traceability, the photometric and wavelength standards are supplied with a certificate and a report detailing the relevant results for the cells. Each cell is individually engraved with the identifying number of certificate. This kit consists of seven sealed quartz cells containing solutions which can be used to check the photometric accuracy, wavelength accuracy, stray light and resolution of any UV-Visible spectrometer. It is ideal for laboratories where regular testing of instrument performance is required by regulatory bodies and in particular, pharmaceutical laboratories and laboratories accredited to ISO 9001. Also available is the Neutral Density Filter Kit which contains three filters of nominal transmittance—10%, 20% and 30% as well as a blank holder. These filters are ideal for quality control laboratories where such standards are required for long term evaluation of the photometric accuracy of a UV-Visible spectrometer. Both these kits offer users the confidence that their instrument is maintained at peak performance levels and ensures integrity of results. For more information contact your local GBC distributor or contact us. The Cintra sample compartment is designed to accept a wide range of modular manual and automated accessories, providing maximum flexibility to suit the wide variety of sample types and applications encountered in modern laboratories. It takes only seconds to exchange the standard cell holder with a specialised easy-to-use holder. Automated accessories plug directly into built-in port in the sample compartment and are automatically recognised by the instrument. There is no need for expensive add-on interfaces or structural extensions. Just drop in the accessory and start analysing. The standard sample cell holder is the 1 x 1 which holds two industry-standard 10 mm cuvettes, one each in the sample and reference beams. It may be used for analysis of single samples, in normal cuvettes. Micro-cell holder with fine-position controls for optimising light throughput. Variable path length holder for rectangular cells with path lengths of 5 to 100 mm. Cylindrical cell holder with a simple spring clip action holds cells of up to 100 mm path length. 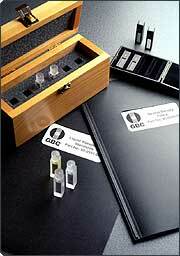 Slide/solid sample holder accepts solid samples up to 10 mm thick.